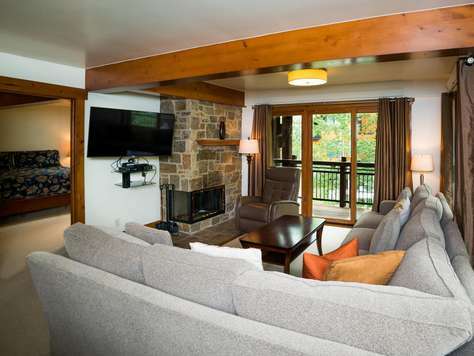 #201 is a second floor unit with 3 ensuite bedrooms offering a king bed, a split king bed, and two twin beds. All bathrooms have upgraded features as well as the kitchen. There is a dining area for 6 and plenty of seating in the living room. Outside there is a wraparound balcony with beautiful mountain views. #205 is a stylishly remodeled second floor unit with an ensuite master bedroom with a king bed. The two guest rooms, one ensuite, each offer a split king bed. 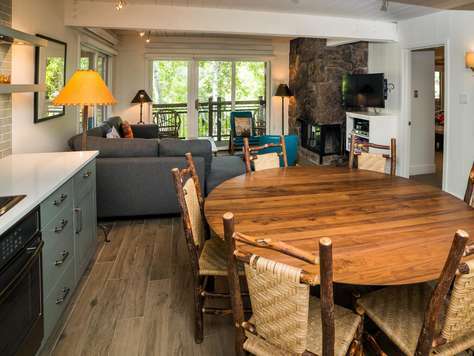 The beautifully remodeled and fully equipped kitchen has a dining room table with seating for 6. 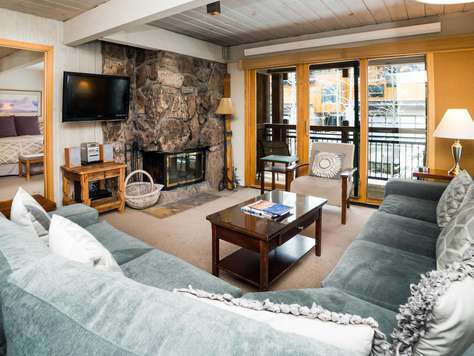 The spacious living room has a wood burning fire place and outside there is a wraparound balcony. 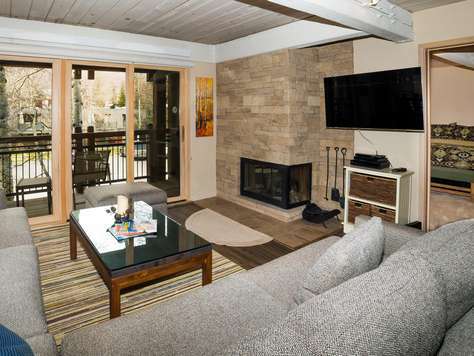 #206 is a second floor unit with 3 ensuite bedrooms. One bedroom has a king bed and the other bedrooms feature split kings. The kitchen and bathroom have been upgraded with attractive tile and granite. The dining area provides seating for 6 guests. The living room offers plenty of seating and there is a nice patio outside the living area. #210 is a second floor unit with an ensuite master bedroom with a king bed, a guest bedroom ensuite with a split king, and another guest bedroom with split king. The fully equipped kitchen has a large bar/counter with seating for 6. 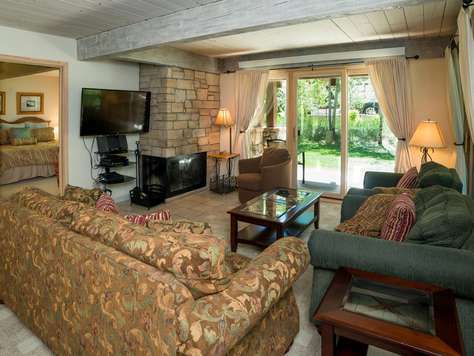 There is a wood burning fireplace in the living room and a large patio outside the living area. #301 is an updated 3rd floor unit with 3 ensuite bedrooms, offering a king bed, a queen bed and 2 twins. The central living area features a dedicated dining area with seating for 6. The kitchen and bathrooms have been upgraded with attractive tile and granite. The living room offers plenty of seating and there is a wraparound patio outside the living area. #305 is a third floor unit with an ensuite master bedroom. The master bedroom has a queen bed and a very large bathroom with separate tub and shower area. One of the guest rooms has two sets of bunk beds and the other guest room offers a split king with a private vanity. Both bathrooms have been completely remodeled with modern tile work and fixtures. The kitchen has all top of the line cabinets and appliances with a large round table that seats 6. Outside the living area is a large wraparound balcony with scenic western views. #306 is a third floor unit with 3 ensuite bedrooms offering two king beds in two of the bedrooms and bunk beds in the third bedroom. The entire condominium has been remodeled making it one of our most popular units. 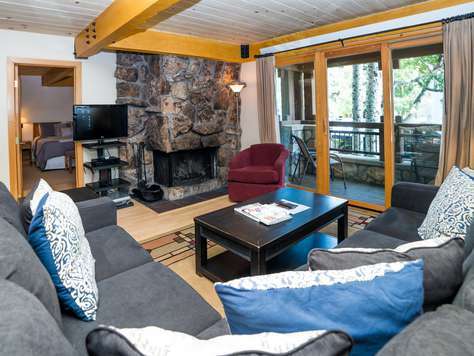 There is a dining area with seating for 6 and spacious living room with a wood burning fireplace. Outside there is a large wraparound deck with beautiful views. #310 is a third floor unit with an ensuite master bedroom with a king bed. One of the guest rooms is ensuite with a split king bed and the other guest bedroom has a split king bed. All bathrooms had shower/tub combination. The beautiful upgrades kitchen has a large bar/counter with seating for 6. Outside the living area is a large wraparound balcony. #406 is a fourth floor unit with 3 ensuite bedrooms. There are king beds in two of the bedrooms and the third bedroom offers two twins beds. The kitchen and bathrooms have been upgraded with attractive tile and granite. New furniture throughout complete this lovely unit. 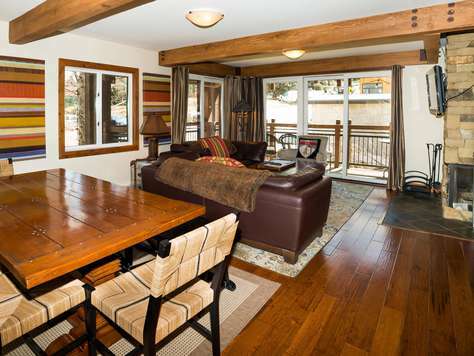 There are hardwood floors in the dining and living area. 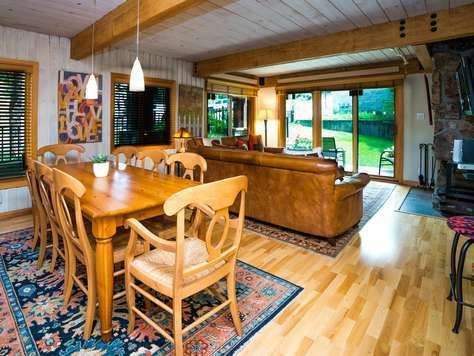 The dining area has seating for 6 and there is spacious seating in the living area. Outside the living area is a large wraparound deck with beautiful southern views.